Russell Westbrook is an aggressive player on the court. The starting point guard for the Oklahoma City Thunder is known for hitting acrobatic layups and unblockable pull-up jump shots. But Westbrook made his riskiest play last year at a postgame press conference, where he wore a pair of fire-truck red full frames and a Lacoste shirt covered in antique fishing lures. Never mind that the young Thunder team had just demolished the Lakers -- where'd he get that shirt? The Los Angeles native isn't the only NBA player to take an interest in high fashion or sit front-row at New York Fashion Week with a Vogue editor (as he did with AndrÃ© Leon Talley at the Zac Posen and Ralph Rucci S/S '13 shows in September), but even the League's most flamboyant dressers shy away from the bright colors and bold patterns that define Westbrook's style. Too bad for them, he says: "I just go with what I like." 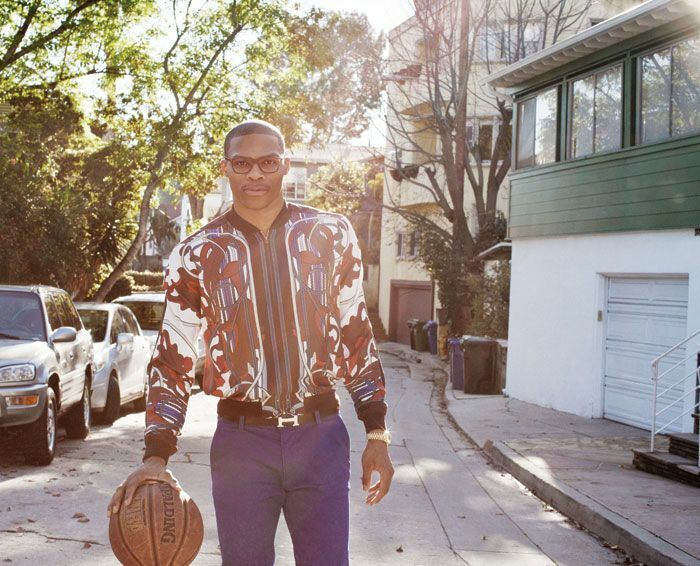 Westbrook's love of patterns goes back to childhood--he remembers posing for a middle school portrait in a Platinum FUBU shirt with an all-over Fat Albert print. Though he visits the malls in Oklahoma City, he mostly trolls websites for ideas. ("Online shopping is the best thing that's ever happened to me.") And what topman.com has done for his wardrobe, iTunes has done for his taste in music -- he was recently caught lip-synching to Ke$ha while on the bench, and he unwinds with Taylor Swift's Red after steamrolling defenders. "I listen to the album, I buy the album, and then next thing you know it's on my playlist!" Styled by Zoe Costello, assisted by Kyle Kagamida / Grooming by Carlene K. at Crosby Carter Management.